You can save your settings in the internal memory of the EQ’s as well as in your D.A.W….AND… in your project with your AUTOMATION. You also have an A/B comparing function known from plugins. By building these equalizers, Bettermaker wanted to create devices that would have a maximum range of usage and a very characteristic, but clean sound. We picked out the best classic designs and modified them to be more practical. As we work faster and faster every day, we need to have the highest quality and maximum speed we can get. 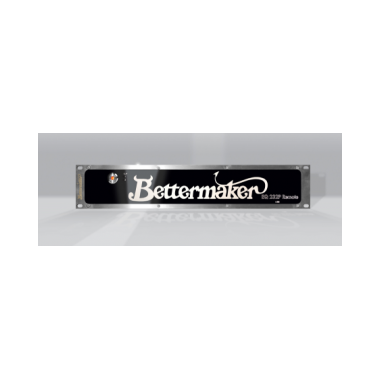 That was the main motivation to develop the Bettermaker® EQ 232P. Now we took a step forward and presented EQ232P MKII. Between EQ232P and EQ232P MKII we took a huge step improving this amazing EQ even more. There is over 30 changes and improvements in construction, firmware and software. This is by far our most complex and perfect product and by it’s sound and functionality compared to it’s price the unit presents huge value to a professional engineer. The remote version of the Bettermaker EQ232P MKII has the Exactly same circuit as the original EQ232P MKII. The only difference is that all operations are done via a dedicated plugin in your D.A.W.